A military charity found selling Nazi-themed merchandise has been ordered to close following a BBC Scotland investigation. 1st Knight Military Charity, which took money from donors in Scotland, touted the products online and from its HQ. Undercover filming by the BBC team also exposed anti-Islamic comments made by a 1st Knight trustee and a volunteer. The charity regulator described the footage as "wholly offensive and inappropriate". The closure order by the Charity Commission came after the broadcast of the documentary, The Great Military Charity Scandal in November 2016. After viewing the BBC footage, the watchdog launched its highest level of investigation. Michelle Russell, director of investigations, monitoring and enforcement at the Charity Commission, said: "The public rightly expect charities to demonstrate the highest standards of integrity and conduct. "What we saw in this case fell short of that. Not only was this charity mismanaged, we also saw evidence of behaviours and attitudes that have no place in charity. "The organisation has now wound up, and I am pleased that we have ensured its assets are redistributed by another charity." Although registered in England and Wales, the charity was found to be fundraising in Scotland through private fundraising companies. It raised funds through prize draw tickets and sold merchandise from its headquarters in Blackpool. 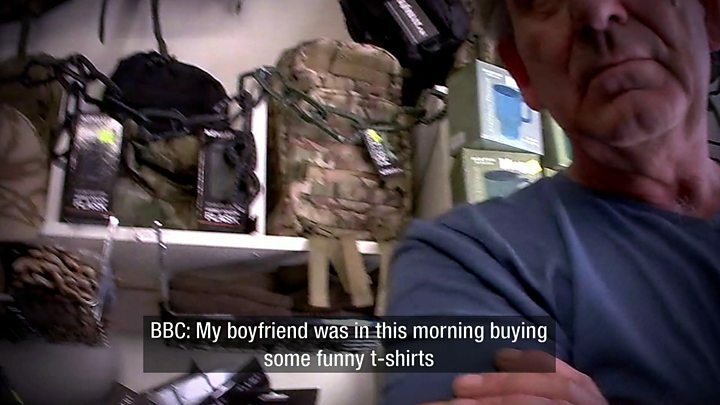 An undercover BBC team secretly filmed the founder of the 1st Knight Military Charity selling T-shirts emblazoned with offensive messages at its Blackpool base. Andy Linihan also sold badges alluding to the shooting of suicide bombers. Velcro badges designed to be placed on uniforms or baseball caps featured a picture of an assault rifle and the words "72 Virgins Express". When asked by an undercover journalist what the words meant, Mr Linihan said they referred to the shooting of suicide bombers. He said: "When they supposedly go up to heaven or wherever they go to, there are 72 virgins waiting for them." He then put on a woman's voice and is heard saying: "Hello Johnny, I'm here, even though my head's blown off", before erupting into laughter. A volunteer for the charity, which organises respite trips for veterans suffering post-traumatic stress disorder, then told the BBC investigator: "We shoot them and they get the virgins." Following the programme, Mr Linihan said he accepted the items filmed by the BBC were "products which ought not to be sold by the charity". He added: "As a result of your visit we have withdrawn the products from the shop and removed them from the internet." Releasing its decision on the charity, the Charities Commission, said it had conducted an unannounced visit to the charity's premises and that the "relevant items had been removed from sale". But it added that "offensive and inappropriate merchandise was still displayed on the charity's online store". On the Charity Commission's website, 1st Knight Military Charity is now listed as "Removed - CEASED TO EXIST". If you want to contact BBC Scotland Disclosure about this investigation or another story follow the team on Twitter @BBCDislosure.